Testimonials – AirZona HVAC Inc.
"Did a great job installing my new Trane unit"
"AirZona did a fantastic job, installing my new A/C. Fast, efficient, and just some nice people. I recommend them for anyone needing A/C service or repair." "Very honest and thorough. The first company that came out didn't even go in the attic to find out for sure if it was my duct work and said it would cost $640 to replace my duct work. When AirZona HVAC came they crawled through the attic and got on the roof to check everything out. The issue was in my unit and NOT my duct work. I would recommend them." "He was pleasant and efficient. He came on time and was wonderful. He took the time to explain everything to me. I will hire him again." "Small family owned who takes pride in their workmanship and familiarity in knowing their trade. I would recommend them and would use them again on any other property." Professional, Prompt. Attempted to repair the AC unit but it was agreed the cost of the repairs made it not worthwhile to repair. New unit will be installed tomorrow morning. Wow am I impressed! Today I had the pleasure of experiencing a true professional installation of my new Ameristar Heat Pump and Reehm Hot Water Heater by a team from AirZona HVAC. The two Gentlemen Gerald and Scott arrived on time and looking professional. We reviewed the project and they answered the few questions I had confidently and professional. Gerald and Scott then went about removing my 20+ year old Mobile home system and replacing it. The work went very smoothly and everything was cleaner then when they arrived! I am now relaxing in my cool living room and marveling at how quiet the new unit is. I couldn't be happier. Thanks to the professional team at AirZona! AiriZona HVAC provided amazing customer service and took care of my AC needs. Scheduling was a breeze and technicians arrived on time. 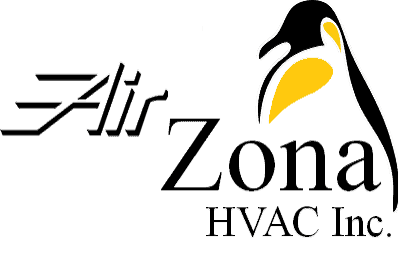 I will continue use AirZona and referr them to friends and family for any AC needs! Keep up the great work! When one of our air conditioning units went out we were prepared to hear the worst. It was a comfort to know that the repair was a simple fix. The technician was honest, professional, knowledgeable, and treated us like family. It was a great experience. Friendly, professional and well spoken, on time and did what they said they would do. Gerald is the best HVAC guy I've worked with. Then new electronic air filter I purchased I just love! No need to dust every other day.